I was eating a baked Cornish hen today, and the scent of it caused a Proustian event — the smell tugged at my memory of another poultry event I experienced while sojourning in Iran back when… My reminiscence involved Isabel, a tiny Portuguese woman who lived next door to me in Melli Rah subdivision — a woman who helped me overcome the first stages of culture shock. Her remedy for all forms of culture shock: paint walls. Five layers of white paint appeared over sickly green walls that an Iranian decorator had thought would please U.S. expatriates suffering from culture shock. 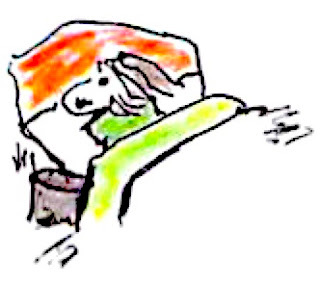 A few weeks later, Isabel began to suffer from symptoms similar to a flu bug traveling through Melli Rah subdivision and telephoned me: “Go to the Ahwaz Super and bring back a big chicken,” she instructed. I hadn’t learned how to drive a shift auto and had to borrow my daughter’s six-speed bicycle to make the necessary trip to the grocery. I had no idea about the speed at which the bike should be set, but it must have been “quick, the chicken soup,” because I didn’t have a chance to pedal. The super speeder flung me down the pock-marked street in 120-degree weather, and I came to an ungraceful halt, over the handlebars, and into the jube near the supermarket. Fortunately, I was unharmed and went in the market to claim a chicken. I remember that earlier that morning I had gone to my tin desk facing the street and penned a column entitled “Persian Poultry Pretty Paltry” for the Daily Iberian, the newspaper of note in my hometown of New Iberia, Louisiana. I’d been writing an “In A Persian Market” column for several months, and when I looked in the freezer at the market, I knew why I had written the column about Iranian poultry. Chicken Little appeared to be a shriveled version of the chickens raised in America, and worse still, she was frozen solid and would take some thawing before I could cook a pot of soup and bring it to Isabel. No, I didn’t die of embarrassment. I hired a taxi that took me to the bazaar and found a real chicken, (still a bit undersized), then made soup. By early afternoon I was able to take the requested "cure for all ills" in a large pot to Isabel’s bedside. The following day, Larry, her husband, washed and returned the pot. A week later, I became sick with a flu-like illness, and Larry asked to borrow the pot, “perfect for making chicken soup,” he said. Evidently, Isabel had no trouble finding a chicken and boiling it — she brought me a steaming pot of soup. She also returned my large, American-made vessel. However, after I recouped, Isabel fell ill again, and I made another pot of soup for her. So, Isabel and I turned off the stove and, voila, we regained good health. And I haven’t had homemade a la Iranian/Cajun, Chicken/Duck soup since we returned to the States. 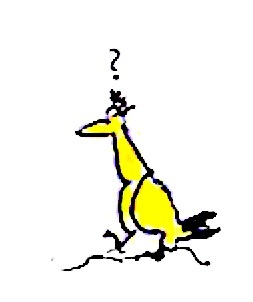 Maybe we just needed a genuine Louisiana fowl from Gueydan, Louisiana — Duck Capitol of the World. This morning as I watch the flickering images of flooding in North Carolina and South Carolina on television, I remember the catastrophic storms that have inundated parts of my home town, New Iberia, Louisiana, throughout the years. Two years ago I published a book of poetry entitled A Slow Moving Stream (the Bayou Teche that flows through New Iberia and southwest Louisiana) and included a poem about the great flood of 1927 that inundated Acadiana. 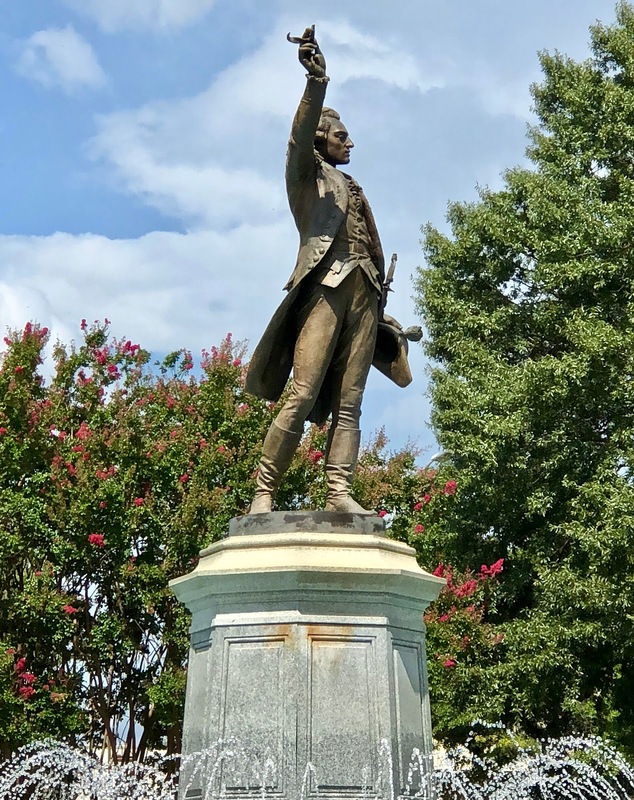 Since that time, New Iberia has endured many hurricanes and floods, but this 20th century storm caused incalculable deaths and damage in Teche country. 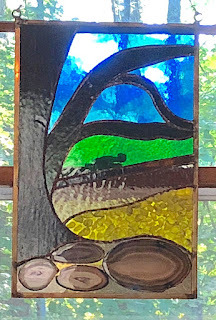 Karen Bourque, master glass artist in Church Point, Louisiana, captured in glass the cover for A Slow Moving Stream, the Bayou Teche near Arnaudville, Louisiana, which became a torrent of water during the flood of 1927. 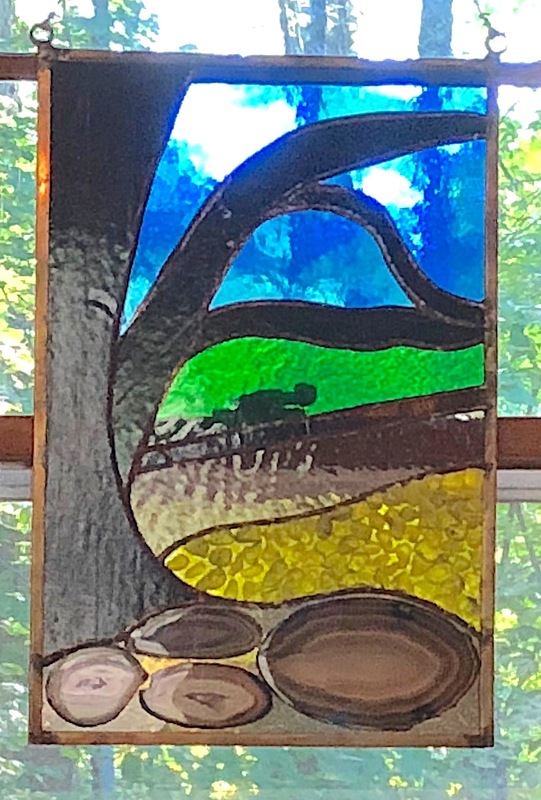 I acquired the glass piece entitled “Beneath the Surface,” and it now hangs in one of the dining room windows of our home in Sewanee, Tennessee. Karen’s words constitute hope this morning. As I look up at the glass piece, her text helps to dispel my angst about the devastation due to storms and floods now battering the Carolinas, and I pray more fervently for those who are enduring this natural disaster. and the sky to become an ocean. What had been green would be green again." According to a study done by the University of Southern Brittany in France, people who pass a bakery and smell the sweet aroma of fresh baking bread are likely to perform random acts of kindness to strangers who approach the bakery. 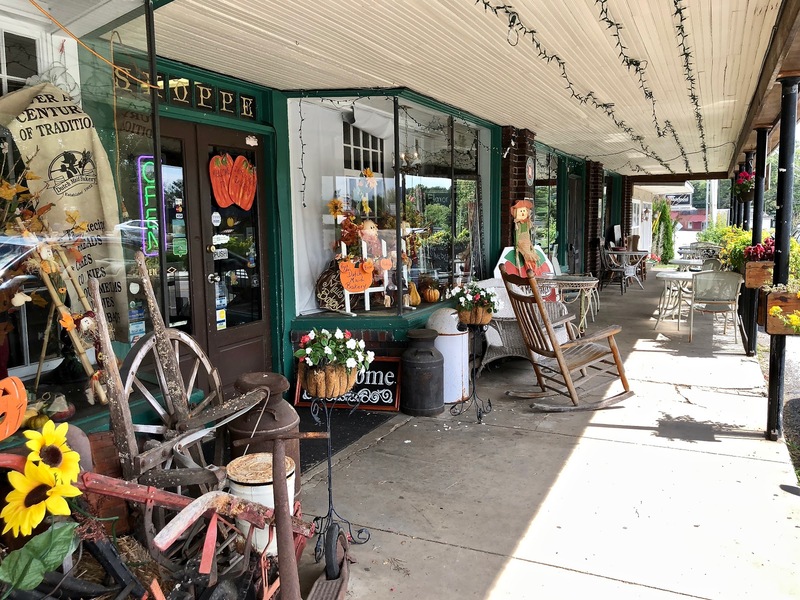 The claim sounds outlandish, but yesterday when we went over to Tracy City, Tennessee and stood on the sidewalk outside of the Dutch Maid Bakery, the pleasant smell of fresh bread that drifted through the front door gave me a feeling of beneficence and well-being. The scent also aroused my sweet tooth. 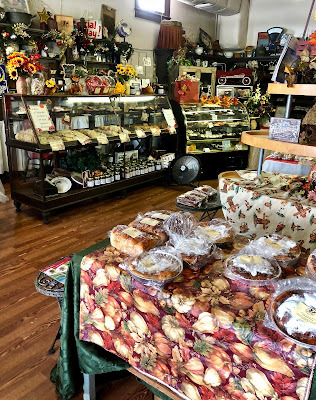 The Dutch Maid Bakery is an authentic Swiss bakery that has been operating in Tracy City since 1902, most of the time under the Swiss management of Johann Baggenstoss and his sons. 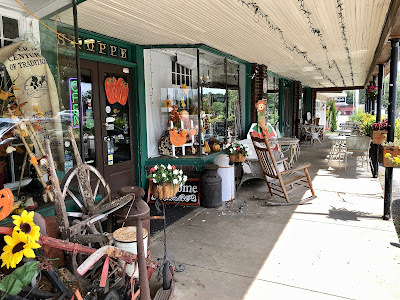 Baggenstoss was among Swiss immigrants who settled in Gruetli-Laager, Tennessee, halfway between Beersheba Springs and Monteagle, Tennessee where only four or five Swiss-built houses and a few people of Swiss descent live presently. Baggenstoss left his home in Rafz, Switzerland for America and some time between 1890 and 1895 became ill and traveled to the Cumberland Plateau town of Gruetli-Laager (named after a town in Switzerland) to recuperate. For awhile he worked at the Beersheba Springs Hotel as head chef and in several other area hotels until he and his wife Louise decided to open a bakery and grocery in Tracy City in 1902. According to The Swiss Colony at Gruetli by Frances Helen Jackson, when Johann’s son John Jacob welcomed the first girl child into the Baggenstoss family, he renamed the Baggenstoss Bakery, the “Dutch Maid Bakery,” the name it bears today. During its early days, the bakery operation served coal miners, and white sandwich bread was sent by train along lines hauling coal out of the mountain. Frances Jackson tells of the bakery at Tracy City supplying 10,000-15,000 loaves of bread a day to feed WWII German and Italian prisoners kept at nearby Camp Forest. The bakery operated 24 hours a day and kept the Baggenstoss family working at an exhausting pace for several years. Following WWII, the Dutch Maid Bakery began making specialty items like sour dough breads and fruit cakes. The family added a Decherd, Tennessee plant, but by 1965 the business had declined due to competing large-scale technologies, and this plant closed. Albert, the last Baggenstoss owner of the Dutch Maid Bakery, sold the business in Tracy City in 1992 after 90 years of Baggenstoss management. However, the name and quality of baked goods has remained constant. 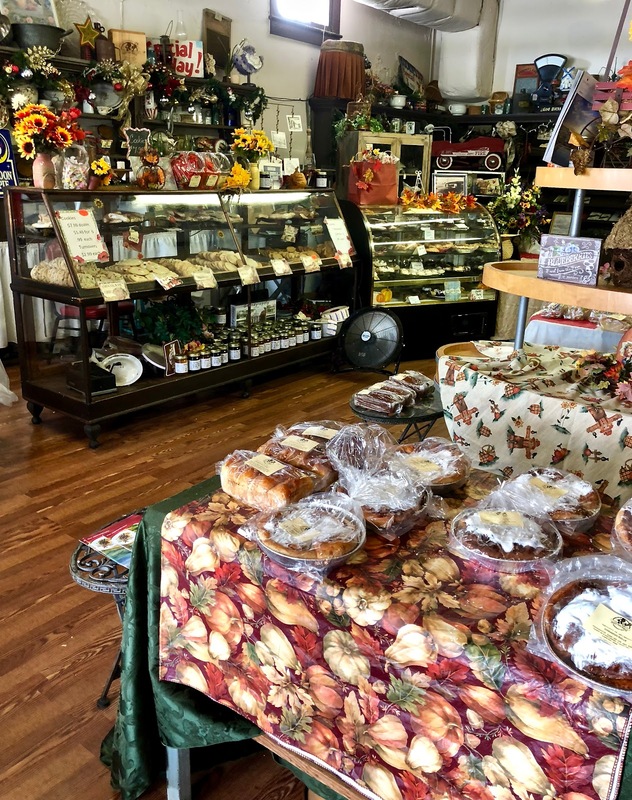 Today, customers can walk into a full-scale bakery where cakes, pies, rolls, breads, cookies, and a complete line of “Tennessee Mountain Moonshine Cakes” in boxes are baked fresh daily. Yesterday marked my third visit to this thriving bakery, and, as you can see from the photographs, the Dutch Maid is gearing up for Halloween already. The Swiss Colony at Gruetli-Laager, once the dream of German-speaking Swiss, has vanished, but the bakery in Tracy City is a testament to some of their successful efforts in the New World, and when customers get a whiff of fresh-baking bread and cakes, they’re liable to develop the kindness to strangers that the French trace back to the sweet aroma of bread. 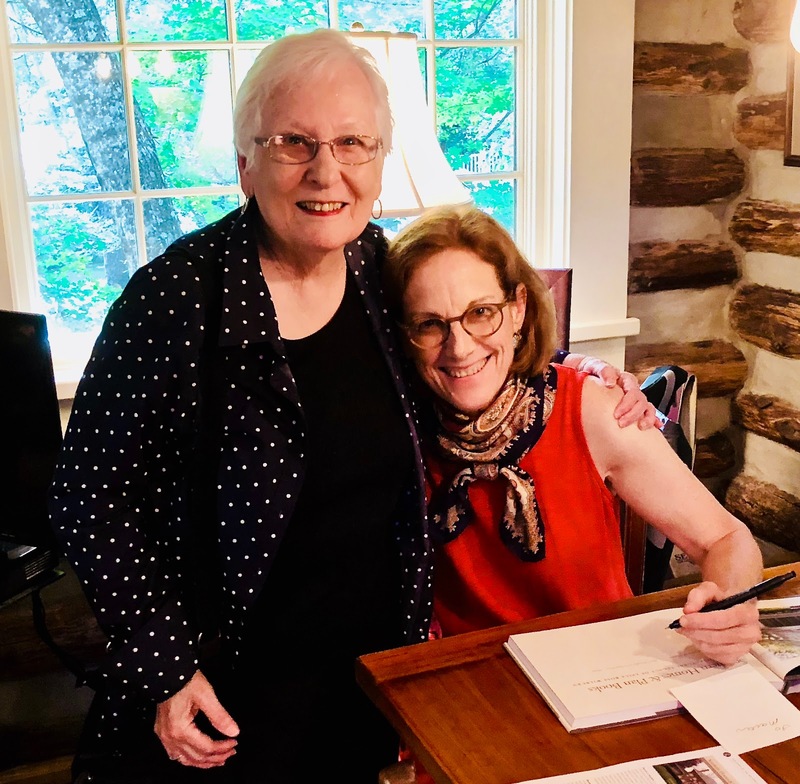 Yesterday evening, I was reminded that my becoming a resident at Sewanee was strongly influenced by a successful architect whose book signing I attended at the Gailor Cabin here on the campus of the University of the South. I’ve known Sarah Boykin, co-author of Southern Homes & Plan Books, The Architectural Legacy of Leila Ross Wilburn, for over 40 years as she spent her teen-age years in New Iberia, Louisiana, my Louisiana home city where I winter. She graduated early from New Iberia Senior High so that she could work on a degree at the University of the South and has been an unofficial ambassador for Sewanee and the University since her graduation. Boykin holds a master’s degree in Architecture from the University of Texas at Austin, and has spent two decades researching and writing about the work of Leila Ross Wilburn, an abiding interest that culminated in the handsome volume that features the design and philosophy of this architect. Yesterday’s book signing was a banner event that took place in an authentic log cabin, another of Boykin’s interests in diverse types of architecture, (she lives in a similar cabin near Gudger Road). Interested readers filled the Gailor cabin, porches, and spilled out into the gardens of the cabin. Sarah Boykin has maintained a family presence with us — she discovered our home here at Sewanee and presented us with the idea of living half the year in this cottage here on The Mountain. She also assisted my grandson Martin in preparing a portfolio of his landscape designs and helped him find his first job as a landscape architect in Atlanta, Georgia. As a blogger who is an omnivorous reader, I try to read the output of all writers I know personally and review their literature, but I don’t have the space to do a definitive review of Southern Homes & Plan Books. However, I can promise that readers, both professionals and laypersons, will enjoy the text and photographs featuring nine plan books and smaller offprints of house styles, from bungalows to colonial and ranch houses, included in Southern Homes and Plan Books. As a native Louisianan, I was interested to read that the Southern Pine Association, headquartered in New Orleans, once commissioned and published plan books similar to Wilburn’s for distribution to lumber yards. The American South was targeted by Wilburn for her plan books, and Boykin’s and Hunter’s book includes beautiful photographs of homes constructed according to Wilburn’s plans and drawings from the plan books distributed throughout the South.. The authors’ research reveals how Wilburn’s designs helped develop many of Atlanta’s historic neighborhoods: Candler Park, Druid Hills, Morningside, and others, as well as those in the Decatur, Georgia District. Of interest to me was Wilburn’s sleeping porches, “a southern adaptation originally built nationally as a preventive measure against tuberculosis in the early twentieth century.” I have published several poems about both my maternal and paternal grandparents’ sleeping porches, which Boykin and Hunter report were accepted as important components of any proper middle-class home in the early 1900’s. Twelve percent of house designs in the 1918 Sears Roebuck catalogue, published in Chicago, included sleeping porches, but in the Southern Pine Association, published in New Orleans, 40 percent of the designs included sleeping porches. These structures were a predominant feature of southern homes, and in the case of my grandparents, both grandfathers slept alone in these enclosures during humid Louisiana nights! An interesting end note: From 1917-1918, Wilburn served in the Army civilian service as a draftsperson for the War Department doing architectural drafting, and during World War II, Wilburn again served as a civilian in the war effort, sometimes working in the development of maps while stationed in Tampa, Florida; and in Washington, D.C., she developed architectural plans and construction drawings for utilitarian structures. Southern Homes & Plan Books contains an appendix, notes, bibliography, photography credits, and illustration credits. The amount of research work devoted to this project is formidable and showcases the work of two talented architects — Leila Wilburn and Sarah Boykin. Boykin has been recognized for outstanding contributions in the development of arts facilities, preservation of historic sites and cultural landscapes, as well as sustainable design. Susan Hunter has completed doctoral work in art history at Emory University and is a resident of a Wilburn house in the Atlanta area. Brava Sarah and Susan for showcasing the legacy of Leila Ross Wilburn in this handsome volume published by the University of Georgia Press. May your interest in historic preservation continue to inspire more exceptional writing about architectural traditions. Photograph of Sarah Boykin and Diane Moore by Victoria Sullivan.